These days, $100 will buy you around 20 rolls of Kodak Gold film, which will give you about 720 exposures—or it’ll net you a Kodak EasyShare C913 digital camera, which gives you a practically unlimited number of exposures (you can shoot until you fill your memory card, then offload the pictures to your Mac), and more features than you’ll find on any 35mm film point-and-shoot camera. If you normally take pictures with your mobile phone (or with a point-and-shoot film camera), then investing $100 in a digital camera is a great way to immediately improve the quality of your shots. Snapshot-quality photos are about the most you can expect with the C913, but if that’s all you’re looking for, the Kodak offering is not a bad deal. The camera’s plastic body is sturdy and comfortable to hold. Its 3x lens does not retract flush with the front of the camera, giving the C913 a slightly unusual shape, but it’s still fairly easy to slip into a pocket. The camera uses one pair of AA batteries. The C913’s 3-inch LCD on the back of the camera is adequate, but sometimes suffers from vertical streaking when you’re shooting in bright light. Compared to other cameras in this price range, the C913’s images are a little grainy and dull, but still usable. Kodak did a decent job of laying out the controls on the C913. A large mode dial on top lets you easily change shooting modes, including auto, movie, landscape, macro, and some dedicated scene modes. The back of the camera provides zoom, delete, and playback controls, as well as menu options. The C913 automatic-shooting modes do a good job of making all critical exposure decisions. Autofocus is fast and reliable, though the camera’s performance in low light suffers from the lack of an autofocus assist light. In some situations, the C913 had a difficult time metering, yielding overexposed images with highlight areas blown out to complete white. Also, the C913 is fairly eager to fire its flash when you’re shooting in auto mode, but the flash rarely causes images to look overblown. The EasyShare C913 has a 3-inch LCD screen. The C913 offers a minimal number of manual controls. It includes exposure compensation, for forcing an over- or underexposure, and you can also change the ISO setting, the white balance, and the flash mode. In addition, the camera comes with an assortment of scene modes, which tailor the camera’s decisions to specific situations and conditions. So if you’re shooting a landscape, switching to landscape mode might yield a more appropriate exposure. For the most part, though, these scene modes don’t do noticeably better than auto mode. One exception is the Night Portrait scene mode, which lets you shoot flash portraits at night without having the background fall back to complete black. Most point-and-shoots in this price range offer a face-detection feature, which automatically locates and focuses on a face in a scene. The Kodak doesn’t offer this, but it’s not a huge omission—the C913’s normal autofocus is good enough. Most similarly priced cameras also offer a smile-detection mode, which tell the camera not to shoot until the subject is smiling. While the C913 lacks such a feature, you won’t miss it much, since smile detection rarely works well on the cameras in this price range that do have it. With a 9.2-megapixel sensor, the C913 delivers very large files that you can easily enlarge to 13 by 19 inches, or even larger if you have a big printer. However, you probably won’t want to blow up the images too far, given the lack of image detail that the C913’s low-quality lens produces. Ironically, if Kodak used a sensor with a lower pixel count, this camera would probably get much better image quality. For basic snapshot shooting, the camera delivers decent results for this price range. Note, though, that as you ratch up the ISO sensitivity, you’ll see a lot of color splotches and grain in your image. 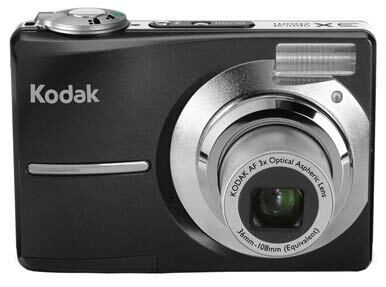 The Kodak provides a 640-by-480, 30-frames-per-second video mode, though you might find it of questionable use given its low-quality, pixelated results. If video is important to you, the C913 is not the best choice. The EasyShare C913 is a decent snapshot camera, with all the features you’ll need for typical everyday shooting. If you can afford to spring for a $200 camera, you’ll definitely get better image quality; but if you can’t, rest assured that the C913 will give you better results than you’ll get with any mobile phone camera, and probably even better than what you’ll get from loading $100 worth of Kodak Gold into a point-and-shoot film camera.